Qualifying starts February 11th on Events Mode! 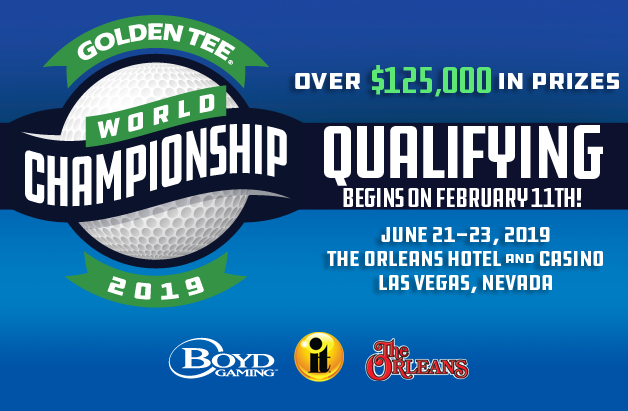 In less than a month, when the clock strikes midnight and Monday, February 11th begins, Golden Tee World Championship qualifying will officially start! Last year there were some pretty exciting updates to the World Championship. We were back in Las Vegas where we partnered with Boyd Gaming and The Orleans Hotel & Casino, hosting the exciting competition on the beautiful and impressive Showroom Stage. We even had Vegas betting odds on our 64 qualifiers. And this year we're back at the Orleans Hotel and Casino, but we’ve raised the stakes even higher. 64 competitors? Not anymore. We've added 8 more spots for a total of 72, and the prize pool is now over $125,000. 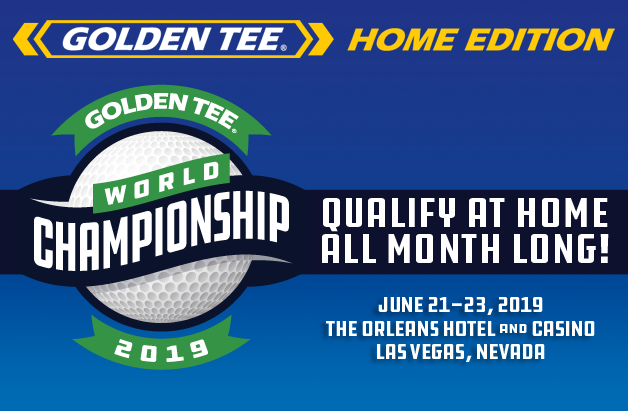 The action takes place June 21-23, 2019 where we will crown our 11th Golden Tee World Champion! The 2019 Golden Tee World Championship will be bigger, bolder and better than last year's event; an already wonderful spectacle. Get ready for a very high-stakes weekend that will provide a tremendous spotlight on the most celebrated arcade golf game during our 30th anniversary year! The vast majority of our tournament field will be filled through our brand-new Events Mode qualifiers. These 12 qualifiers will run between February 11 and May 5, providing players with twelve different weeks to secure their spot. The Qualifier Events will be broken down into twelve separate week-long events, where, along with a massive weekly prize pool, five top players will qualify each week for the World Championship. Each event will offer a single course, with different setups every time you play. Your best five scores from the week, Monday through Sunday, will be combined to get your overall total. Great Shot Points in those games will serve as a tiebreaker. Play as often as you like during the week to improve your scores. Remember, games played with different cards or IDs cannot be combined, so be sure to check in with the same ID each time you play. Once each week-long event has concluded, the leaderboard will be cleared and the next opportunity begins. Once a player is qualified, he can still participate in the next Event for prizes, but any spot they qualify for will be awarded to the next non-qualified participant who meets all the requirements. Please note: all games must be played and completed in Events Mode Play. This is for you, Alaska, Louisiana, New Jersey and South Dakota. Due to prize play limits for Arizona, they are also apart of non-prize play qualifying. During the week of March 18 - 24, players who live in these states will be able to qualify for a spot in Las Vegas simply by playing at their favorite Golden Tee location. Our second GT Fore! remastered course, Crawdad Swamp, will be released into the wild on March 18th. Non-prize play players will qualify on this course. Similar to the qualifying events, the top 4 players with the best 5-game average score for that week on Crawdad Swamp will secure a spot for Sin City. Scores from online Stats, Contest (Glory) and Invitational games will count. If you are the proud owner of a Golden Tee Home Edition that is up to date with the 2019 software, you’ll want to listen to the following. Five Home Edition owners will make their way to The Orleans in a qualifier that will take place starting March 1. We’re changing things up a little bit for the Home Edition qualifier. We will be using the world rankings to get our top 100 players for the month of March. Your best scores on the five original 2019 courses will count towards your World Ranking, with Great Shot Points serving as a tie-breaker. The first 100 players in the Home Edition World Rankings will be invited to a special IT Invitational contest through the GT Caddy. The course will be a randomly selected course from 2019. The top 50 finishers of that Invitational contest will be invited to another contest, where we whittle the field down to 25 players. Those 25 players will then compete in a final Invitational contest, where the top 5 finishers earn their spot into the 2019 GT World Championship! Please note: to qualify, you must play be a Home Edition owner and play on your own 2019 game. Be sure to download the GT Caddy and register your Player ID. Power Events, Club Lucky Group and Gametime Amusements/BJ Novelty have been given passes to be awarded to the winners of their respective LIVE event competitions. Mark Stenmark won Club Lucky’s TOC 10 in October and Steve Beattie won the Power Events Lil’ Gun competition in December. The Gametime/BJ Novelty Mid-America Championship takes place on February 1-3 where the 1st place finisher in the amateur bracket will receive our final LIVE events spot. On Friday, May 10, the winner of this day’s Money Shot is in—just one shot is all it takes. Play Money Shot as often as you want that day to get as close to the pin as you can. In the instance that the day’s winner has already qualified, the qualifying spot will go to the first player on the leaderboard without their spot secured. This year, we’re qualifying a player—any player—on sight at The Orleans. On the night of Friday, June 21, we will host a special Closest to the Pin Contest where anyone can walk up and enter. The winner of this contest will not only take home a huge cash prize, but he or she will also fill our 72-person tournament field for the World Championship competition on Saturday and Sunday! Please note: If qualified players are unable to make it to the World Championship for any reason, Incredible Technologies has sole discretion in filling the remaining spots to secure a full field for the World Championship. So start practicing and get ready for the biggest boldest and wildest competition ever in Golden Tee history! Best of luck to all competitors and we will see you in Vegas in June!